Limited Stock Sale! 2 left! Angle grinder adapter for most angle grinders with a 5/8-in. threaded arbor. Screw on adapter for reducing 5/8 in. -11 thread to the smaller M10 x 1.25 thread and arbor size. 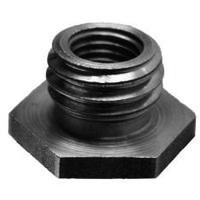 The adapter is commonly used on wire cups and wheels. Adapter is a common size for most angle grinders.